This is one of our all-time favorite pancake recipes!! They whip up in a jiffy and my kids wolf them down even faster!! I often can’t seem to cook them fast enough to sit & eat with my kids at the table! (In my opinion, a decent sized griddle is worth the $20 investment if you don’t have one! You can make more pancakes at once and they cook more evenly.) I don’t know about you, but we love having breakfast food for dinner on occasion! These are made with blueberries (one of the best fruits you can eat for your health) and also flax seeds (a great way to get your omega-3’s without eating fish!). Flax seeds are so incredible healthy and they also make the best egg-replacer. If your not on the “flax-train”, its time to buy a ticket! They store wonderfully in the freezer (whole or ground) for maximum freshness. This recipe is from ‘Vegan Planet’ by Robin Robertson, which is one of my favorite vegan cookbooks. I like to use fresh blueberries whenever possible. When you use frozen berries, sometimes you end up with purple-ish pancakes – which is no biggie – my 5-year-old daughter definitely doesn’t complain! 1) In a large bowl, combine the flour, sugar, baking powder and salt. 2) Blend or whisk the flax seeds and water until thick. Let side for a minute, then whisk again. Add the soymilk and vanilla. Whisk well! 3) Pour wet into dry, mixing until just moist. Fold in the berries. 4) Pour pancakes onto griddle (Personally, I like to use my 1/3 measuring cup for a good size.) Cook until bubbly, then flip. Repeat with remaining batter! Devour! 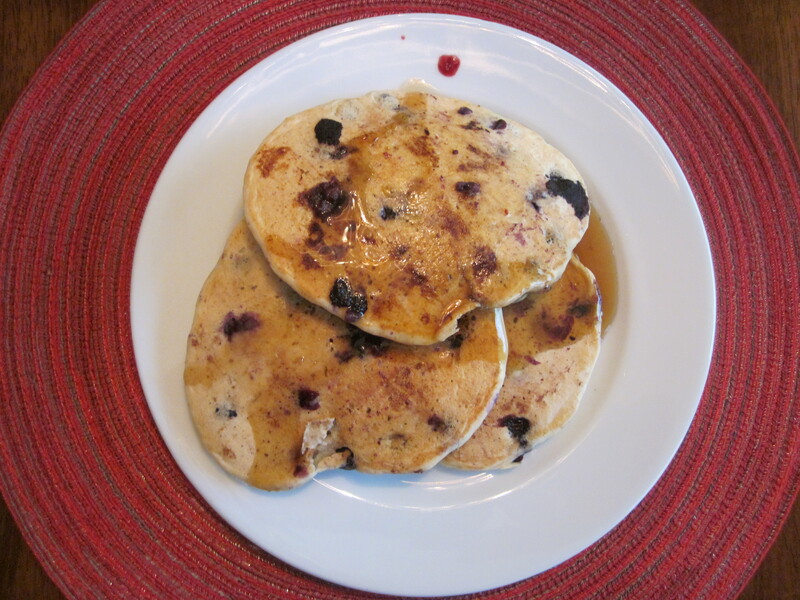 This entry was posted in breakfast, Vegan, vegetarian and tagged blueberry pancakes, breakfast, flax pancakes, pancakes, vegan breakfast, vegan pancakes. Bookmark the permalink.